Time to Talk day is part of the Time to Change Wales campaign, which aims to end the stigma and discrimination faced by people with mental health problems. We know that 1 in 4 people will experience a mental health problem. We also know that talking about mental health doesn’t need to be difficult and it can make a big difference. The aim is to get as many people as possible across England and Wales talking about mental health. By joining together on one day, we can break the silence that often surrounds mental health and show that talking about this once taboo issue doesn’t need to be difficult. With thousands of individuals and hundreds of organisations speaking out together at the same time we can make a huge impact and show that it really is time to talk. Please take five minutes out of your working day to talk about mental health. 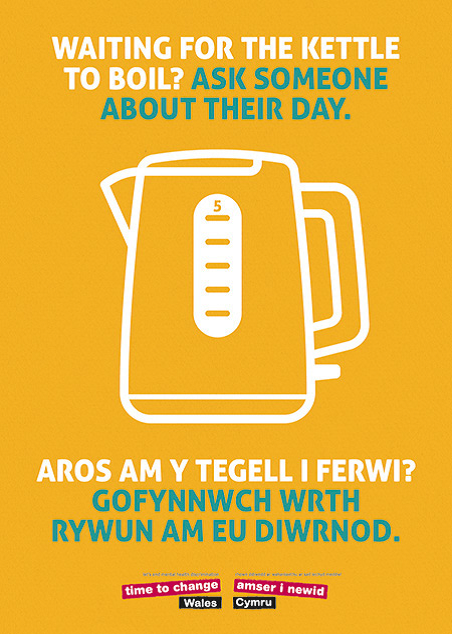 There are some great resources which you can use on the day, with a helpful conversation starter guide (available in English and Welsh) if you need some help getting started. It could be something as simple as making a colleague a cup of tea and having a chat or just telling someone how you’re feeling today. 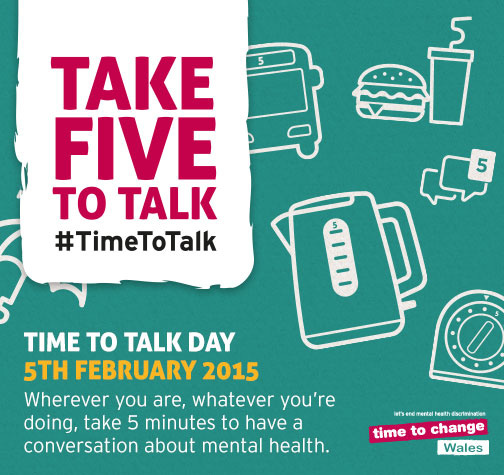 All activity in Wales can support the Time to Change target of 24hrs worth of conversations – please do go online and log your five minutes at: http://www.time-to-change.org.uk/timetotalkday-5minutes. Today is a great opportunity to take 5 and have a conversation in your workplace – let’s all help get Wales talking about mental Health! I’m off to a great start – I spoke to a complete stranger on the train coming into work! And I’ve just logged my five minutes. Has anyone else had a conversation yet?